The following are a few thoughts on designing a worship service. Though I strongly hold to the “free worship” philosophy, I have adopted a few ideas from my Presbyterian (PCA) friends, which include the section headings Call to Worship, Confession and Assurance of Pardon, and a Benediction, etc. These are present to serve as guidelines, making sure that worship is as complete an experience as possible. The section headings do not need to be announced, however, but are there to ensure that the overall content is comprehensive and robust. I refer below to Isaiah 6:1-11 as a very helpful template for designing a service. This is only one method, but what a fantastic strategy to use—try it yourself! Please check out the series I started last week—”Living and Worshiping with Purpose.” Thanks for reading! John MacArthur gave an apt description for effective worship service design when he said, “Worship is deliberate, purposeful, and active. It involves not just the thought process, and not merely the emotions, but the whole being as well. The life of a true worshiper is a joyous, vibrant life—a life of actively seeking worship to glorify God in practical ways.” Borrowing MacArthur’s hypothesis, I design services of worship with three goals in mind: to be orderly, focused, and dynamic. Orderly worship is constructed with thoughtful, conscious effort. 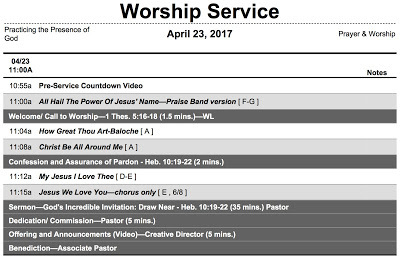 So many modern worship plans are mistakenly assembled with mostly musical considerations as the highest priority. Dr. Bruce Leafblad proposed the example of Isaiah 6 as an ideal pattern for corporate worship, offering that, “[it is] the kind of encounter our hearts long for when we come to worship Him.” The Isaiah 6 pattern is founded upon the prophet’s personal encounter with God, presented in verses 1-11. Leafblad divides the particular encounter into two parts: God’s actions and Isaiah’s (the worshiper’s) response. Music should—as with other aspects of a service such as prayer, Scripture reading, and the sermon—serve to support the main function of a worship service: to facilitate a congregational encounter between God and His people, resulting in awe and worship for God (Is. 6:1-4), through confession of sin and assurance of pardon (vv. 5-7), and commission (v. 8), utilizing revelation and response as the general format. In this meeting with Isaiah, as in every encounter, God led the exchange. Therefore, with Isaiah 6, the modern church has a thoughtful form with which to follow. I embrace the normative principle of worship, which, as Daniel Block describes, “…allows Christians to incorporate in their worship forms and practices not forbidden by Scripture, provided they promote order in worship and do not contradict scriptural principles.” Even as believers are free to assimilate effective biblical worship expressions to benefit various cultures, it is prudent to establish a revelation/ response pattern, which is a dialogue between God and the worshiper throughout the service. This allows a leader to measure whether they have satisfied a robust discourse between God and the worshiper. Focused worship planning makes every effort musically and technically, along with a Spirit-led ministry mindset, to “remove distractions in worship services to secure an unobstructed view to the glory of God [Isa. 62: 10; 57:14].” This allows scrutiny concerning transitions in the service that require special attention, creating pleasing continuity between music and segment changes, along with entrances and exits by participants to and from the pulpit/ stage area, etc. Simple forethought will allow a smooth, free-flowing and unbroken focus by the congregation during the worship service. Dynamic worship is greatly dependent on congregational participation and a flowing God/ worshiper dialogue. A destructive blunder the Roman Catholic Church made in the early centuries of the church—which was somewhat corrected by the Reformation—was to limit or completely eliminate congregational worship in place of professional priests, who worshiped on behalf of believers. Unfortunately, even today—for a similar need to control quality and content—some free churches in the Evangelical tradition still limit congregational participation. Many churches have a stage/ audience concept informing their worship service strategy, usually due to a facility’s performance-oriented physical layout. The tendency, then, is to plan mostly for activity on the stage with little regard for the average congregant, inadvertently considered ‘the audience.’ Philosophically, when God is understood as the true audience—the receiver of praise—then worship may be planned biblically, even in a theater environment. This will enhance the interaction between ‘real people’ with God in the doxology. This must include choosing effective, easy-to-sing, and easily understood songs, with scripturally centered lyrics. Because congregational singing and participation is biblical (Col. 3:16; Eph. 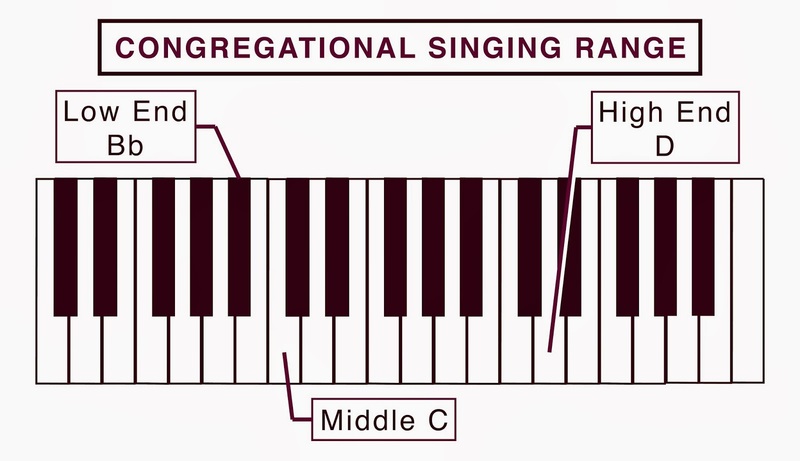 5:19), it is crucial for songs to be accessible—arranged in congregationally friendly keys. As a practical consideration, a prudent leader would do well to incorporate new songs along with older ones that have a historical and emotional context within the congregation, including hymns, classic choruses, and songs that have become community favorites over the years. A sensible strategy would be to apply a holistic approach in designing worship among multiple generations, even various cultures within a congregation. 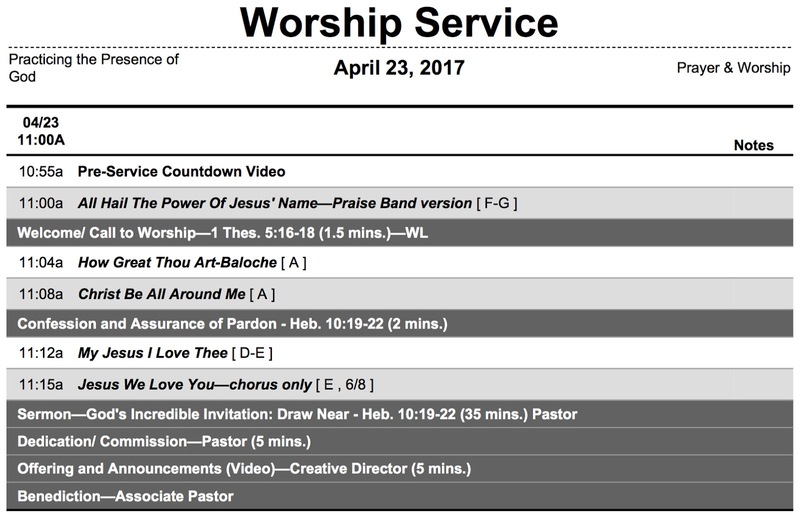 An overall helpful planning technique I have developed is to incorporate the “Five Ss”: 1) Determine the Spiritual Statement of the service [‘Big Idea,’ theme, takeaway]; 2) Determine the Song Selection (theme, spiritual intent, tempo, key, etc. ]; 3) Determine the song Sequence [most effective order of the songs and spoken segments]; 4) Consider Segues [musical or spoken strategies which tie each piece together in the service]; and 5) Be Sensitive [to people, but more importantly, to the Holy Spirit—be willing to change course mid-service]. John MacArthur, Worship: The Ultimate Priority (Chicago: Moody Publishers, 2012), 175. Dr. Bruce Leafblad, “Presentation: The Dialogue of Worship,” Liberty University Online, WRSP 835 lecture, https://download.liberty.edu/courses/o3t4f.mp4 (accessed April 20, 2017). Daniel I. Block, For the Glory of God: Recovering a Biblical Theology of Worship (Grand Rapids: Baker Academic, 2014), Kindle Edition locations 320-323. Jamie Harvill, “Personal Ministry Evaluation,” a paper submitted to Dr. Donald Ellsworth for Liberty University Online, WRSP 835, April 16, 2017. 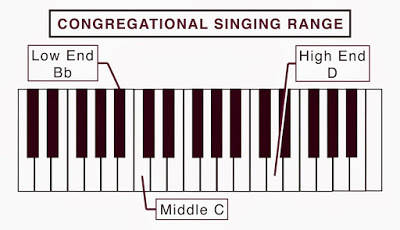 Congregational Singing Range: for the lowest note, do not go lower that B below Middle C or above D—an octave and a step above Middle C—unless it is to reach a quick passing note that is no more than a whole-step away. Jamie Harvill, Worship Foundry: Shaping a New Generation of Worship Leaders (Bloomington, IN: WestBow Press, 2013), Kindle Edition locations 1784-1787.